Typically, we recommend that Agency users create Custom Metrics in their Agency Account, use them in a Databoard, and send that Databoard to Client Accounts. In most cases, this will make onboarding Clients quicker and more efficient. However, there are some cases where Custom Metrics will not work properly when sent to a Client Account. In HubSpot's API, Smart Lists are identified and tracked by a unique ID rather than by the Smart List name. Therefore, even if you have Smart Lists named identically across all Client Accounts, you will need to re-configure the custom metric using the Smart List Query Builder at the Client level. If a custom metric is utilizing the Filtering functionality, then there is a chance that the Filter is Account-specific and won't work for multiple Clients. Let's use the following custom metric as an example to explain this further. 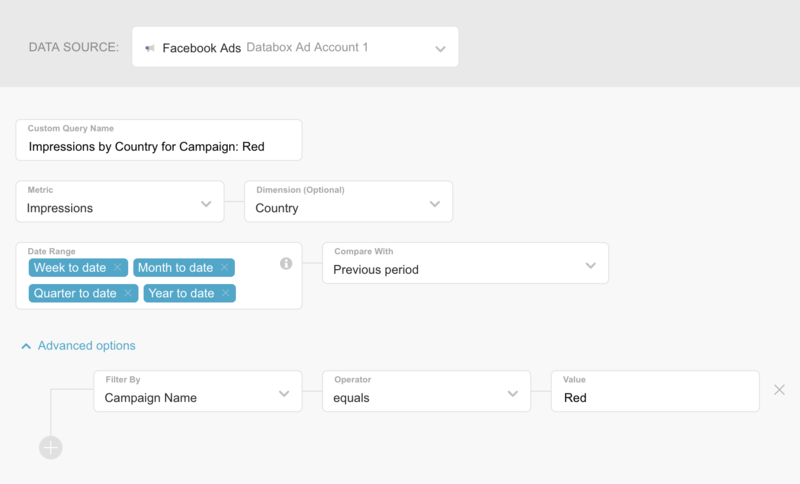 This custom query was built to look at Impressions by Country for a Campaign called "Red." If we were to use this in a Databoard and send the Databoard down to a Client Account, the Impressions by Country metric will not populate unless the Client has a Facebook Ads Campaign running called "Red" as well. Most of the time, this is not the case, which is why it's recommended that Account-specific Queries are created in the respective Client Account.